I wish I could believe everything the Mayor and his team tell me. If there’s one thing that Boris Johnson is good at, it’s making promises. TfL have recently produced this video about their vision for cycling in London. And it sounds wonderful. Oh, the things they say! Doesn’t it all sound great? And such inspirational music too! Unfortunately, I don’t believe them. It’s nothing but propaganda and hype, and the cracks are already visible. Despite these fine words, the plans are already failing to live up to the promises made. The biggest let-down is the proposed Central London Grid – it’s rubbish. It’s not even a grid! If you read David Hembrow’s articles on the grid concept, you’ll see that what’s required is a dense network of cycle routes, enabling anyone to cycle from anywhere to anywhere else. That isn’t what we have here. It includes Hyde Park (which closes at midnight) and Kensington Gardens (which closes at dusk! ), and includes bits of canal towpath (which are narrow, and dark at night). This isn’t a grid, it’s a joke. Don’t kid yourself – the reason Gilligan loves the “quietways” concept so much is not because they’re great for cycling, but because they don’t get in the way of all-important motor traffic. It’s been tried before, and is proven to be a failed concept. How is this convoluted patchwork of back-streets any different from the half-hearted LCN? I’ve updated the Royal Parks to reflect their part-time status, and changed a canal route to grey to reflect the lack of social safety. You’ll note that motor vehicles remain on the straightest, most convenient and most desirable routes, which TfL directly control. 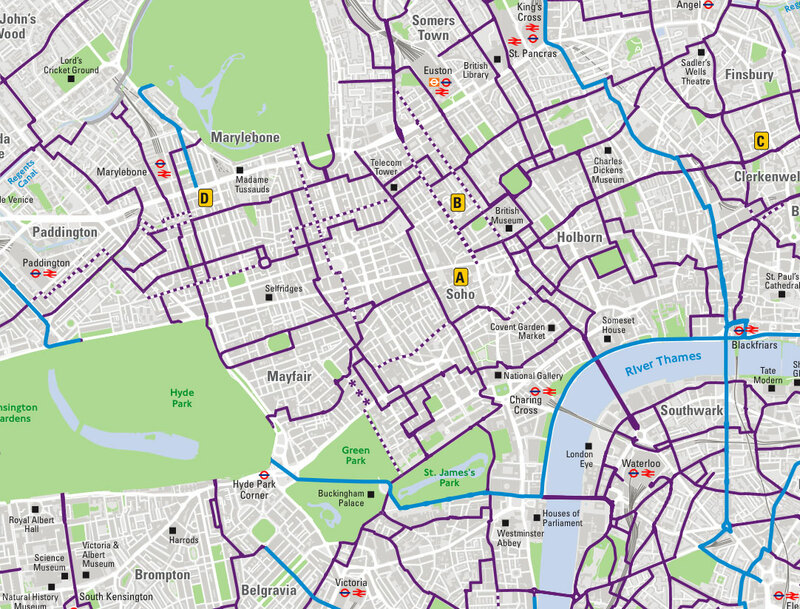 This so-called grid for cycling shows only convoluted back-street routes on borough roads, and you know that Westminster will do all they can to prevent any real change for the better on their roads. And remember: this is their opening gambit! It’s not going to get better from here, only more and more watered down. If this is their dream plan, then the bold promises made in the video have already turned to ashes. Why are TfL expecting the borough councils to handle all the cycle traffic on these back streets? 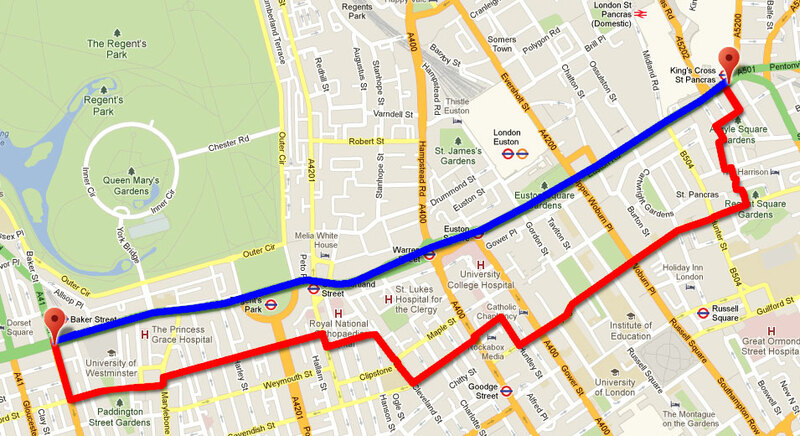 What about Euston Road, a TfL-controlled 6 lane-wide motorway which cuts across the city from Paddington to Angel? Why is nothing being done there, or on any of the other multi-lane direct roads under TfL’s control? You can send TfL your thoughts on their grid attempt until 14th of February using this email address: grid@tfl.gov.uk. 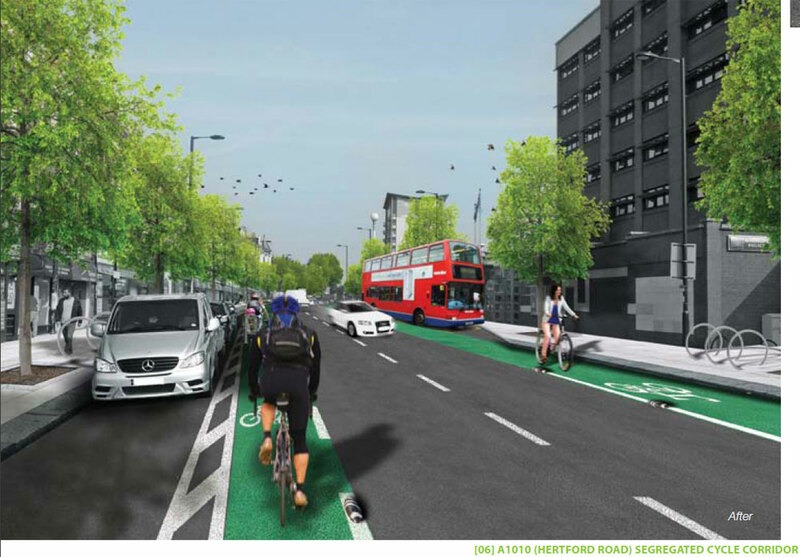 I’d also like to touch upon the “Mini-Holland” proposals. I can’t claim to have read all of them in detail, but I have been through most of the shortlisted ones, and I can say this: Andrew Gilligan’s promises are already broken. This is because even the best of these “Mini-Holland” proposals will not in any way create conditions “as good for cycling as their Dutch counterparts” – every one of them falls short in some major way. All of the proposals are at least a little bit disappointing in their failure to really understand what makes Dutch cycling conditions so safe and inviting. All the proposals feature brand new ASLs as some sort of solution. Many of them misinterpret Dutch practice and apply it to unsuitable roads. Some of them focus largely on leisure routes. All of them bang on about soft measures such as bike maintenance classes or poster campaigns. The London borough councils really need to go on a Hembrow Study Tour, as they clearly only have the vaguest idea of what Dutch cycling infrastructure actually is. Maybe I’ll write more about the Mini-Holland proposals once the final decision is made about which boroughs have won the mini pot of gold (as there’ll be less waffle to wade through once they’ve chosen the winners). If this travesty is Dutch, then I’m a Dutchman’s uncle. So the plans for Andrew Gilligan’s much-discussed “Quietways” are starting to appear. I’ll say now that I’m not impressed by these plans. They seem to consist of nothing but signs on a route which is already fairly quiet, although not quiet enough in my experience, as much of it needs modal filtering to prevent motor vehicles using it as a through-route. But these weak plans seek to solve none of the problems that exist along the route, they are mostly just window dressing of the existing infrastructure. For example, the planned changes on Globe Street offer nothing new for those cycling – quite the opposite in fact, as they introduce four new points at which people riding bikes must give way, while providing no benefits over the existing arrangement. It works pretty well already (despite the incorrect signage, and even with a lorry parked on the street). The junction mouths could be wider to allow cycling two-abreast, and there’s a superfluous island (I assume it’s left over from before 2010 when the street was one-way for motor traffic with two-way cycling, before the junction became bikes-only, hence the now-oddly-positioned arrow), but it does work fine. In fact Pilgrimage Street, on the other side of Great Dover Street, ideally needs the same bikes-only junction treatment. Southwark’s over-engineered plans are a waste of money and energy, and offer no improvement over the current layout. My question is: how does this make cycling easier or safer? It feels like a desperate attempt to spend the Quietways money somewhere – anywhere! – rather than admit that the plans are nothing but some signs and paint and spend the money on something useful. Don’t get me wrong, if foot traffic is high then we should consider giving it priority over other modes. This is a design I’d love to see on some of London’s other, car-filled roads, by the way. But that wouldn’t ever be considered – it’s only where bikes are concerned that we can tame the roads, it seems. Cycling in the other direction, THREE new give-way points for people on bikes are to be installed. The first is just before the raised pedestrian crossing, the second is just before the car park exit, and the third is just after the car park exit. I have absolutely no idea what the third give-way is for, other than to punish people for riding a bike. After negotiating all that, there’s a fourth give-way to a dead-end carrying no motor traffic at all. Why the priority can’t be changed in favour of bikes on the Quietway, I have no idea. The number of other vehicles using that part of Trinity Street must be almost zero. This particular test of stunt-bike skills is designed to stop people using the street as a rat-run by motorbike – and kudos to the residents for preferring to have a quiet street instead of the dubious pleasure of being able to drive out of it at both ends (unlike the residents of Gilbert Road in Cambridge who value saving a few minutes’ driving over clean air, quiet roads, and safety). But surely there are better ways of preventing rat-running by people on motorbikes without reducing the cycling capacity to almost zero? And it does massively restrict cycling capacity, as it takes so long to negotiate safely. Many mount the footway to get by, though my favoured solution was simply to use the parallel Cole Street, which features no such restriction. This isn’t designing for mass cycling, it’s a bad joke. I’m not even sure that the anti-(motor)bike fence is needed any more anyway, as Trinity Street’s junction with Great Dover Street has been blocked off now. It would be simple to extend the new plaza to separate Trinity Street from Falmouth Road, meaning that Trinity Street would be a dead end and of no use to rat-runners. However, the only planned improvement to this ridiculous bottleneck is to move the two central fences away from the gap, by 30cm, “to comply [with] current cycling design guidelines and ensure cyclists of all abilities can negotiate this feature”. 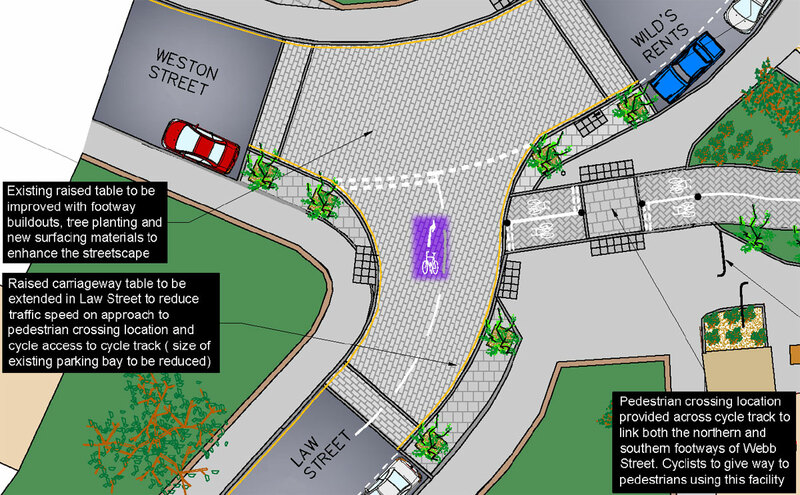 This is paying lip service to the concept of cycling infrastructure which is suitable for all ability levels – no such worries seem to have occurred to the designers elsewhere on this route. Webber Street, Great Suffolk Street and Law Street are all currently used as rat-runs by people driving motor vehicles, and under these plans they are to remain so. This is not designing for all abilities. The Google Streetview camera catches a typical scene at the junction of Webber Street and Great Suffolk Street. There are only superficial changes planned at this junction, so the scene above will continue to occur. What if the lights turn green just as you start to pull out, do you trust the drivers not to move forward? 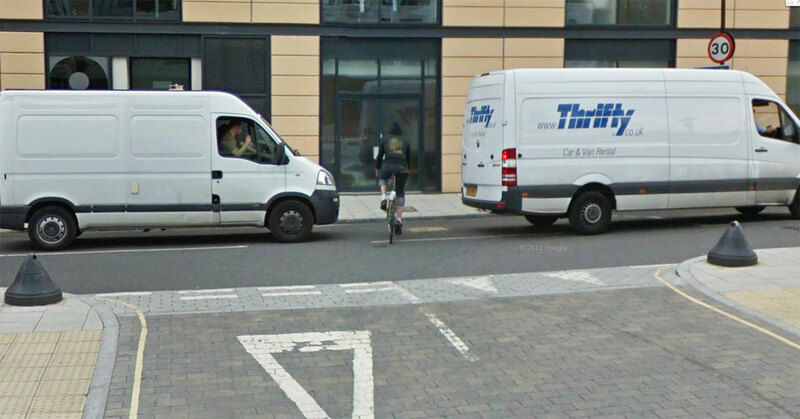 Can you see if there are more bikes coming from the left, hidden behind the van? Can you imagine members of your family making this manoeuvre? A few bollards and entry restrictions would fix this in no time, making the junction bikes-only by blocking off the end of Webber Street as well as Great Suffolk Street to the west. So why are no such improvements included here? They genuinely would improve the roads for people cycling, while keeping access for residents and businesses, and would cost very little too. Law Street has the same problem. It should be a quiet residential street, but stand there at rush hour and you’ll see it’s mainly used as a speedy short-cut by people driving cars. If a cycle route isn’t suitable 24/7, then it’s not a cycle route. I’ve highlighted the Quietway right turn in a lovely shade of official Quietway purple. Can you imagine a young child waiting there while cars were passing around them on all sides? Put some bollards on the junction at the end of Law Street and the problem is solved. The right turn along the Quietway can then be made safely, rather than waiting in the centre of a maelstrom of taxis. Two other points about Law Street: Firstly, you’ll see a pedestrian-priority crossing of the cycleway at the end of Law Street. Why isn’t the same pedestrian priority being installed on the carriageway? The truth is that motor vehicles are far more dangerous than bikes, so people on foot need more help to walk where there are motor vehicles than where there are bikes. And yet I keep seeing designs that suggest the opposite, that the very concept of a bike is toxic and lethal while all cars are made of marshmallow and driven by kindly vicars. Secondly, the “bikes right turn” painted symbol could lead drivers to believe that all bikes indicating right are turning onto the Quietway cycleway, whereas some will be turning onto Wild’s Rents instead, potentially leading to dangerous under-taking on the junction. The plans for Tabard Street are over-engineered, with a short length of unnecessary cycleway that looks too narrow, and bike symbols painted in the door zone of parked cars (this particular intervention seems to feature throughout the plans). Regular readers will know that I’m an advocate of high-quality physically separated cycleways, but this ain’t it. We need them on busy main roads, not on quiet back streets! I thought the whole point of the Quietways project was to use cheap measures to reduce motor traffic on a string of roads to form a safe cycling route. So I don’t understand the need for the pointless cycleway here. 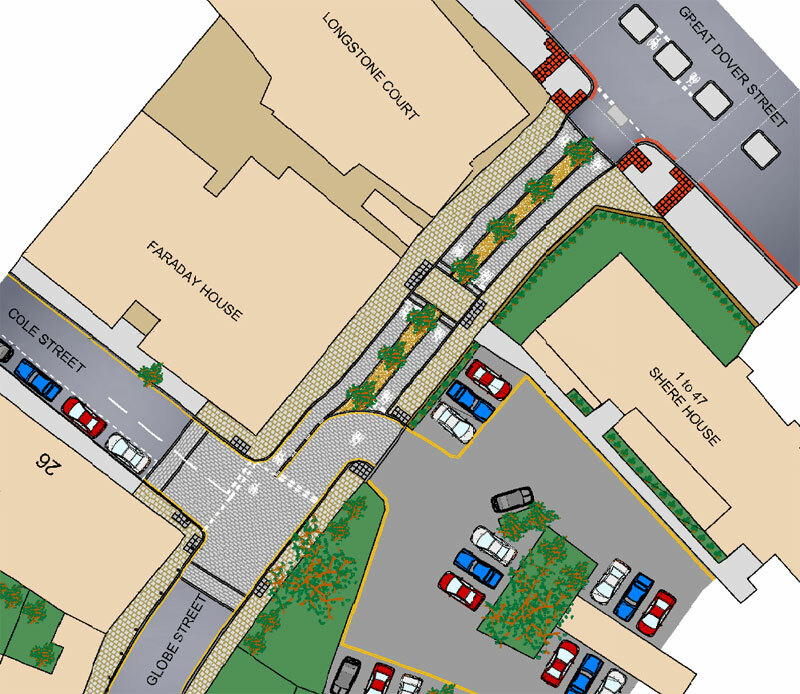 Furthermore, I’m concerned that footway and general carriageway improvements appear on the plans. I’m all for improving the footway but surely this should not come out of the cycling budget (especially removing old, redundant driveway drop-downs as seen here on the ‘plan I’ PDF, surely property developers should pay for this when they remove the garage or driveway?). And what to make of the fact that in only 2.4 miles, there are apparently a grand total of 41 humps along the length of Quietway 2 in Southwark? I get the impression that the scheme has some money behind it that must be spent, but as the designers are unwilling to add filtering to remove routes for motor vehicles, they don’t know where to spend it. Hence the ridiculous over-engineered stuff on Globe Street and Tabard Street. I’m still not convinced that the Quietways concept is even a good one. It seems to be a continuation of the failed dual network approach, where some people are expected to put up with inconvenience while others put up with danger. Who are these people who currently won’t cycle, but will happily leap onto a bike once Andrew Gilligan installs some signs along an already existing, convoluted, twisty-turny route full of humps and rat-running drivers, where they have to constantly give way to everyone? I’m not sure that these people exist. The whole idea seems to be designed to shut cycle campaigners up while not upsetting the all-important drivers by making any actual changes to the roads. The Quietways don’t seem to form a network, and they’re definitely not the fine grid of interconnected cycling-friendly routes which are needed to enable mass cycling. It feels a lot like we’re repeating the mistakes of the recent past by creating yet another version of the failed London Cycling Network, with isolated scraps of strange infrastructure, fading paint, and neglected signs scattered around the city. It doesn’t even live up to its branding, as many of the roads that should be “quiet ways” are, in reality, speedy rat-runs which are to remain exactly as they are. If you’re minded to take part in the consultation – and given the result of recent consultations I’m not sure it’s worth the bother – then you can submit comments via Southwark Council’s website here. After my last post about Southwark’s pointless plans to waste cycling money on their section of Quietway 2, I’ve had a think about what I’d suggest. Some of the route is already fine, but the bits that aren’t fine have too many motor vehicles on them. While Southwark want to throw money at fancy paving and plants, what this route really needs are modal filters to remove motor traffic while allowing bikes to pass through. This is cheap because it’s just bollards and a few signs. Politically it’s trickier because car-owning residents often want to drive out of their street at both ends, but I’d be amazed if car-free households aren’t the norm in this area by quite a large margin. The added bonus of more greenery, safe places for their children to play, cleaner air and quieter streets should be enough to get most residents’ approval, I should imagine. And the nice thing is that this can be trialled easily and altered or removed if it doesn’t work, saving any “place-making” for when the changes are proven to work. In this scheme, for example, I can see the plaza on the corner of Webber Street and Great Suffolk Street being expanded across the existing junction. This sort of thing should come later, though there are plenty of firms willing to sell their expensive designs for fancy paving without actually changing the nature of the traffic passing through. Suddenly, and for a bargain price that can’t be beat, the whole of Webber Street and Great Suffolk Street will now carry so little motor traffic that they’re safe to ride. Further east, the northbound rat-run on Tabard Street is removed (vehicles currently enter from Great Dover Street via Becket Street, turn left up Tabard Street, then right along Pilgrimage Street), while full access is retained. The filtering at the top of Law Street also makes safe the turn into and out of the Rothsay Street cycleway, which under the current plans looks awfully dangerous. I’ve gone no further because I’m not familiar with the area from this point, I always went up Wild’s Rents from here on a complicated, meandering route towards Tower Bridge. The consultation on this section runs until the 5th of September (with the western-most section until the 15th), so there’s a few days left to respond now. 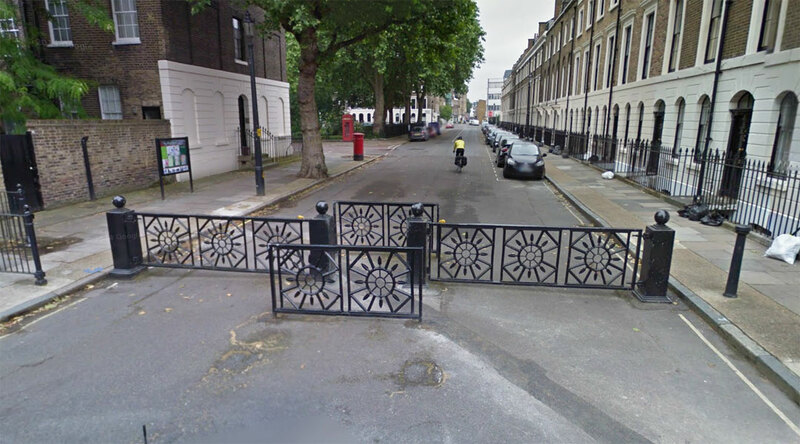 Addendum, 2nd February 2015: One of the hot debates along the route is the awful restrictive gateway on Trinity Street. Having thought about it, the simplest solution is to move it so it’s to the south of the Globe Street junction. It will still perform its motorbike-filtering purpose there, but not interfere with the Quietway. Ta-da!